Four years I’ve waited to see inside this building, and finally I’m here. 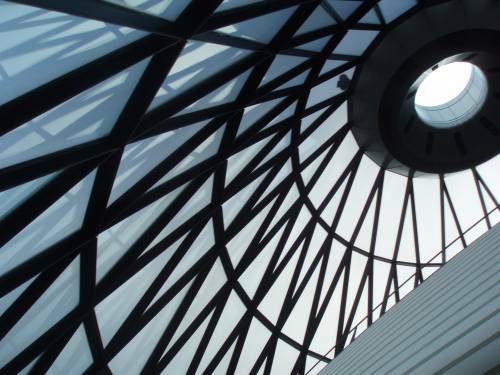 The lift opens to reveal a cat’s cradle of metal holding up concentric circles of sky. There’s space all around us – the confinement of street level has pulled back to a widescreen view of London. The whole of the City, the river, St Paul’s and a gaping wide firmament above. Atop stairs of shiny black stone, a string quartet is playing. The towers of Docklands reach behind them, whilst far below to my right Tower Bridge stands in miniature under a gunmetal grey sky. Drinks and conversation await, but I can’t concentrate on much more than the view. I flit here and there, for a few words and a smile. As the day slowly fades, the skyscrapers around us edge closer. Tower 42 lights up first, amidst a starfield of reflections. The sky darkens and we stand suddenly smaller, floorbound beneath our indigo cage. It grows late. 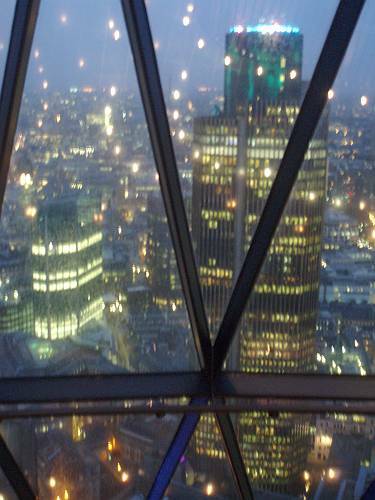 The lights of London are blurring across the glass as reluctantly we descend, the doorway framing a bright triangle to lead into darkness beyond. Outside, a light rain is falling. Our ten-year long summer is over, and a chill wind gusts through these streets. 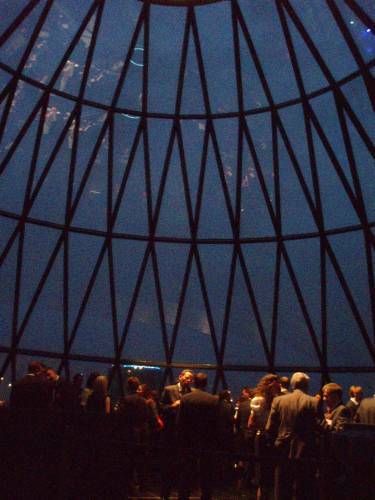 With each new footstep, the Gherkin rises taller behind us, whilst unseen up above her high crystal window pierces the future’s dark sky. 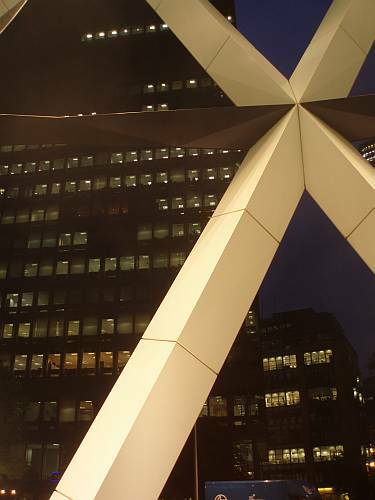 The City of London stands deserted, abandoned to night. Blackness bears down now in a deep cloud of foreboding. The financial heart of the world lies silent, awaiting its fate. 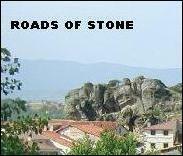 This entry was posted in 2008, history, life and times, London. Bookmark the permalink. Great shots here. 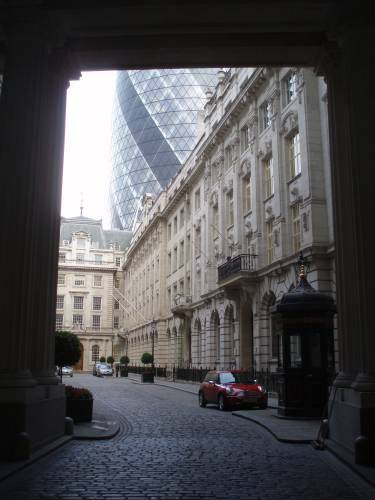 For a look at how the Gherkin looks on the inside while seeing a great film in its own right, see Match Point. Many thanks, Ian, and excellent to hear from you. These are interesting times we are living in. Interesting times. All best wishes to you in Hamburg, from here in London. Totally cool, text and photos, especially the last shot. If the dollar’s ever worth more 40 cents again, I have to get back to London. Thanks, Ella. 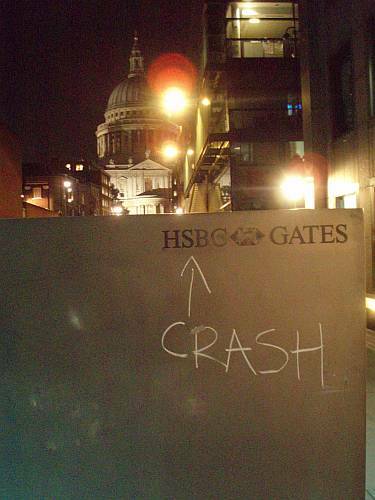 Yes, that last shot shows London’s typically minimalist black humour in the face of financial crisis. As Jon Taplin elegantly shows, New York put it more bluntly last week. Aye, night’s falling right enough Roads. Night armed with bitter chill and bone-numbing cruelty, seeking out Fat Cats and City Rats with it’s icy fingers. How quick we are to denegrate our politicians, blaming them for all ills. But wither the monsters of the markets? Those pig-bellied, pin-striped dinosours sucking on cubans and swilling fine cognac as their creation writhes in what appear to be ugly death-throws? Hang stocks and shares – bring back the stockades! Stale bread, rotten fuit, mouldy hubris and deseased, over-inflated egos should be piled high and made available to the great unwashed. 11.3 billion on bonuses in ’06, 7.3 billion in ’07 . . . I wonder what Julian and Celeste can expect this Christmas? Were there any justice in the world they’d be lucky to get a pack of kindling and a cardboard des res, but of course the world don’t turn that way. No, it’s the plebs who’ll pay, through fear and loathing at first, then tax-hikes and service cuts. If there’s one thing we’ve learned from history it’s that we continue to learn nothing from history. What a corall of dumb, nose-led beasts we are. Baaaaaaaah! ‘This sucker’s going down’ – George Bush. Well, today that might just be the only true quote he ever uttered. Here’s an excellent and instructive article to explain the global financial crisis. Short, and very succinct. And here’s Steve Bell of The Guardian in response. Glad you made it inside – a near spiritual experience. 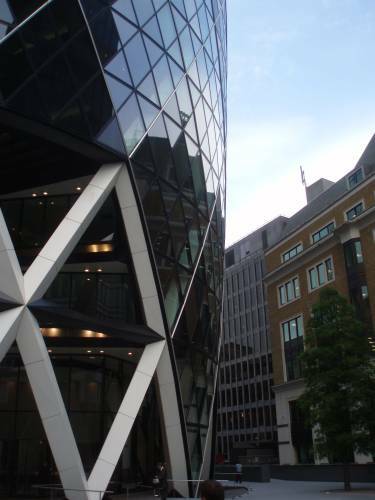 Brown may not have mended the roof during our ten year summer, but I’m very glad someone got round to building the Gherkin! 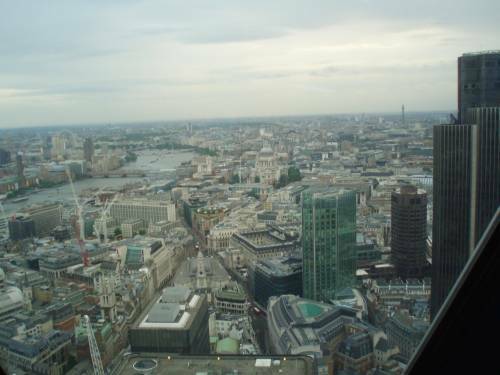 Thanks, Keith — it’s very good to hear from you again, and yes, it’s quite a view from atop the Gherkin. I know what you’re saying since in Britain we share more personal debt than any other developed nation. Yet in my view it’s far too easy to blame Gordon Brown for the depth of our current economic crisis, since it goes back much further than that — to Mrs Thatcher’s fostering of a share-owning middle class, and even back further, through the home-owning dreams of a British aspirational middle class, already identifiable even in Abigail’s Party from 1977. We were all sucked into it — and how many of us can really claim to be such paragons of economic common sense and good virtue over these past three decades that we have never ever discussed house prices at a dinner party, at some stage or other? The illusion of unending growth, and the lure of ‘easy money’ — these are the familiar traps and the get-rich quick schemes that catch us out in one form or other, time and time again. For the moment, cash is king and the banks are refusing to do any business, since logically by far the best and safest trade they can possibly do is through paying the government bail-out and its 12% coupon. In rescuing the banks, we have succeeded in leaving businesses and individuals without the means to invest. Our institutions may now be safe, but our economy is in pieces, and fragmenting further every day. The New Year now has to see some real loosening of liquidity, or I fear we’re all going to be looking through the glass very much more darkly, very soon and for a lot longer to come. Many thanks again, Keith, and all best wishes to you for 2009.